This is not your average yoga retreat. We don't run on set dates on rented properties. Tuscan Fitness runs its retreats from March to October every year. No set dates for our retreats. You choose when to arrive and you choose what activities to participate in. We'll make sure you relax! A unique Retreat combining Yoga, Fitness, hikes and relaxation. Pick your own dates, stay for as long as you want. Relax by the pool,play tennis, practice yoga, go on hikes and eat delicious, healthy meals in our hotel's restaurant. 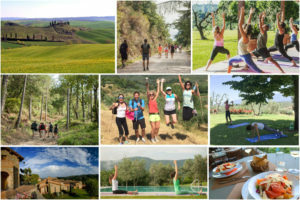 Tuscan Fitness offers unique yoga and health holidays combining a yoga retreat with a relaxing holiday in the Tuscan countryside. 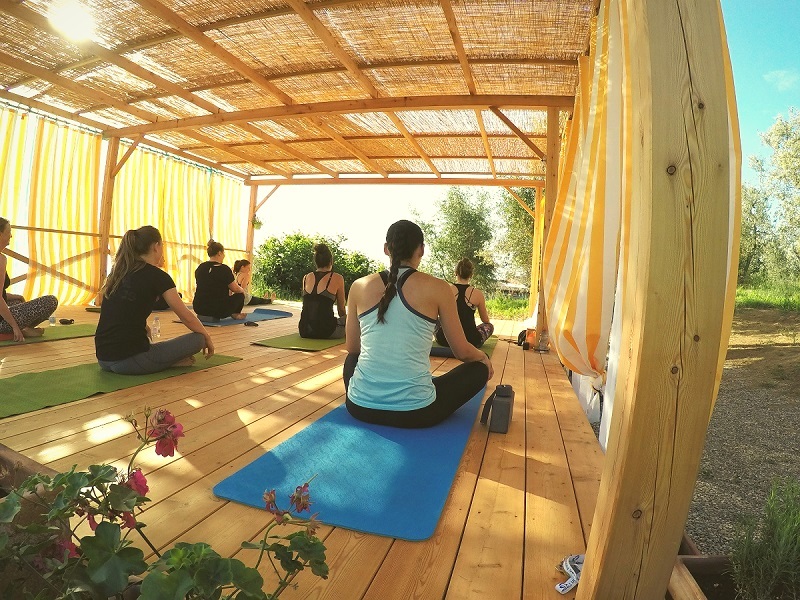 practice yoga, go on hikes and relax by the pool in a beautiful Tuscan hotel. Pamper yourself for as long as you want in the tranquil atmosphere of the Tuscan countryside. Practice yoga, get massages, relax by the pool while enjoying great, healthy meals for as long as you need to. 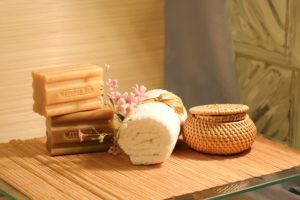 This package is designed for those who wish to indulge in the senses. The day will consist of a yoga session and an optional hike or circuit training and while the others are partaking in fitness you will be having a massage on site. 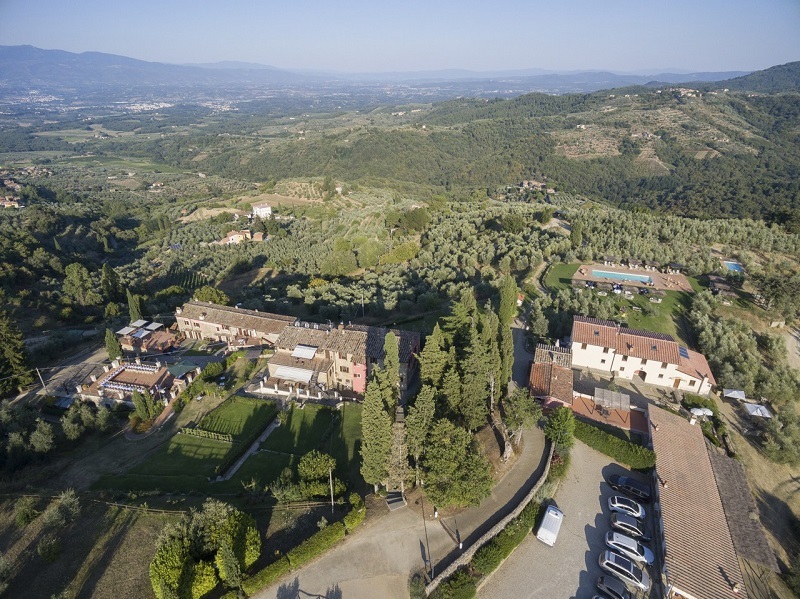 Set on a green Tuscan hilltop, the hotel property is a charming mix of classic Tuscan style and more modern comforts including a large swimming pool and a great restaurant. The property is spacious but retains a calm and welcoming atmosphere. The hotel is also conveniently located for those interested in making day trips to the famous towns and cities in the area, including Florence, Arezzo and Siena. At Tuscan Fitness, we offer a number of different yoga retreats. We focus specifically on Ashtanga and Vinyasa yoga for all different levels so that you can learn as a beginner or simply delve more deeply into your practice if you are more advanced. The daily classes are taught by a number of teachers so as to offer different styles and levels of activity. We aim to work your physical body and also your mind so that you can feel at peace with your surroundings. Many of the hikes that we take our guests on leave directly from the hotel and traverse the beautiful rolling hills nearby. 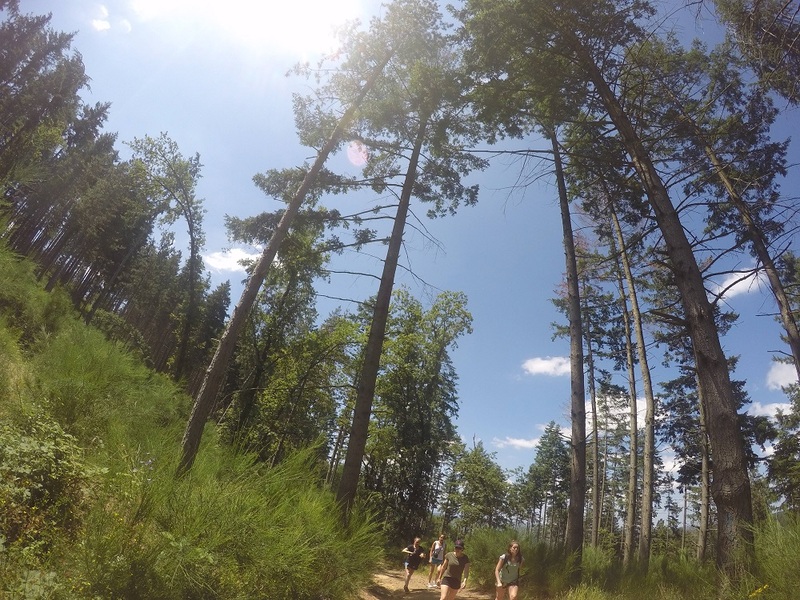 We have researched and mapped many new hiking trails in the area to maximise our clients’ experiences. We have a variety of options for guests who wish to take a leisurely walk across the countryside or more extensive hikes for those accustomed to hiking and looking for a challenge. Contact us for more information on the hiking trails. Ready to Become a Yoga instructor? If you have any questions about our package options or would like more information about the location, the activities or the meals, please don't hesitate to get in touch with us. We look forward to hearing from you. What about Prices for Shared room accommodation? The prices for a shared room is a possibility but is only available if there is someone else asking for a shared room at the same time. We can offer a single room price and if another person asks to share before the final payment is due, we will send an updated invoice with the price for the shared room. How do the shuttle transfers work and are there specific pick-up and drop-off times? Shuttle transfers to and from the train station are at set times throughout the day. For clients travelling to Tuscan Fitness by train, we have set pick-ups at Midday, 15:00 and 18:00. For departures from the hotel to the station, our set times are 11:30am, 12:30pm and 14:30. For a specific transfer time outside of this set timetable, there is an additional cost of €25. We ask that clients communicate their travel times to us 48 hours before their arrival. Shuttles are available upon confirmation, and will not be at the station unless communicated prior to arrival. Can you organise a shuttle service from the Florence or Pisa airport? We would be happy to organise a shuttle service to pick you up from the Florence or Pisa airport, but this is not a Tuscan Fitness service. We work with third-party companies who specialise in local transport. The cost for a transfer to or from the Florence airport is €150 and to or from the Pisa airport, the price is €200. These are standard industry prices and can not be negotiated via Tuscan Fitness. *As aforementioned, these transfers are offered through a third party company that has been working in the area for many years.They are licensed NCC drivers and unless booked well in advance the transfers CANNOT be guaranteed. Yes, it is your health holiday after all so you can choose to customise an existing package to suit your needs. We offer a variety of day trip options and exercise possibilities, but keep in mind that customising a package will be an additional cost and therefore more expensive than the existing packages. Can I add days on to the existing packages? Yes, we can accommodate requests made ahead of time for additional days that can be added to the existing packages. We only need to know with enough of a window ahead of time to be able to make the necessary arrangements. Are there additional costs for city tax?